On March 27, Indian defence scientists along with space scientists achieved yet another first for India. It was the successful test and demonstration of India's A-SAT (the anti-satellite weapon test when it brought down our own low orbit (300 km from earth) decommissioned satellite. The missile took off from Dr. APJ Kalam range at Balasore in Orissa and hit the target satellite over the Bay of Bengal in a matter of three minutes. However, only a little while before this space spectacle, there was anxiety across the nation because Prime Minister Narendra Modi had tweeted about an impending important announcement. One such announcement tweet on November 8, 2016, about demonetisation, sent shock waves across the country. This tweet, however, heralded a joyous response across the nation as Mission Shakti's successful exploits became top news within minutes. The feat means that India is only the fourth country after US, Russia, and China to have the capability to destroy a satellite which can be used against the interest of our country. India's scientific fraternity has only been smiling ever since. At the international level, very few countries have the capacity to build their own satellites and launch them over their own space. The India Space Research Program and ISRO achieved this decades ago and recently India demonstrated its prowess by launching over 100 satellites of various countries into space at one go. ISRO or the Indian Space Research Organisation has always maintained a vision to harness space technology for national development while pursuing space science research and planetary explorations. India has two spy satellites orbiting around the country. They are meant to warn in the event of war or a war-like situation. The movement of troops, of artillery or equipment, and signalling during war and peace are also supported with satellite data. Enemy countries can destroy troops or equipment while on move paralysing a nation's capacity to fight. War, in conventional terms, was earlier fought on the ground, later it started being fought over the seas and air and. India has displayed its prowess on all three fronts. It is believed that with the advent of space research playing a crucial role in a country's development, future wars would start in space and result in victory on the ground by conquering space. In this regard, Mission Shakti has provided credible deterrence to the country and if at all we have a similar situation like that of post-Pulwama attacks, China in the event of a war-like situation would not be able to use A-SAT against us since we have proven our capability. We have a network of satellites, which provide us with communication, weather forecast, remote sensing, navigation, vital information for share markets and for other purposes such as education, ocean travel, air travel, and agriculture. It also warns us against possible disasters and natural calamities. If at all there is a war-like situation ever, and the 'enemy' tries to paralyse either spy satellites or this network of satellites, the country can come to a standstill since communication including that of mobiles could be hampered. Former president and former DRDO chief as well as the man behind India's integrated guided missiles development program (IGMDP) Dr APJ Abdul Kalam always said, 'strength recognises strength'. Mission Shakti has put India in the league of a handful of nations including US, Russia, and China to have A-SAT capability. This insulates the country from possible attacks from China in the worst of times. 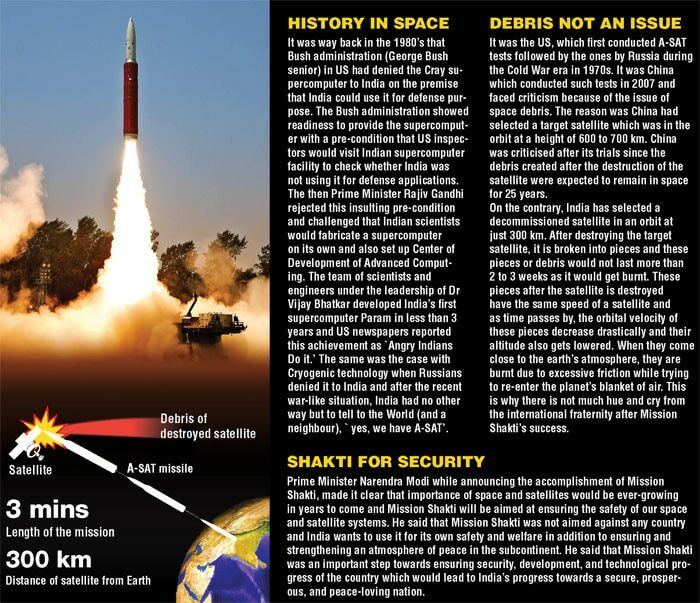 It is therefore being said that Mission Shakti has provided India unprecedented Shakti since future wars would be fought in space and won on the ground. India’s telecommunication satellite, GSAT-31 was successfully launched on February 06, 2019 from Kourou launch base, French Guiana by Ariane-5 VA-247. GSAT-31 is configured on ISRO’s enhanced I-2K Bus, utilising the maximum bus capabilities of this type. This satellite will augment the Ku-band transponder capacity in Geostationary Orbit. Weighing about 2,536 kg, GSAT-31 will provide continuity to operational services on some of the in-orbit satellites. The satellite derives its heritage from ISRO’s earlier INSAT/GSAT satellite series. The satellite provides Indian mainland and island coverage. The designed in-orbit operational life of GSAT-31 is about 15 years. India’s Polar Satellite Launch Vehicle (PSLV-C44) successfully injected Microsat-R and Kalamsat-V2 satellites into their designated orbits. The PSLV-C44 lifted off from the First Launch Pad at Satish Dhawan Space Centre SHAR, Sriharikota in its 46th flight. GSLV-F11 successfully launched GSAT-7A, ISRO’s 39th communication satellite from the Second Launch Pad (SLP) of Satish Dhawan Space Centre SHAR, Sriharikota. GSLV–F11 is ISRO’s fourth generation launch vehicle with three stages. The four liquid strap-ons and a solid rocket motor at the core form the first stage. The second stage of the vehicle is equipped with high thrust engine using liquid fuel. The Cryogenic Upper Stage forms the third and final stage of the vehicle. GSAT-7A with a lift-off mass of 2250 kg, is a geostationary satellite carrying communication transponders in Ku-band. The Satellite is built to provide communication capability to the users over the Indian region. India’s next generation high throughput communication satellite, GSAT-11 was successfully launched from Kourou launch base, French Guiana by Ariane-5 VA-246. Weighing about 5854 kg, GSAT-11 is the heaviest satellite built by ISRO. PSLV-C43 lifted off from the First Launch Pad (FLP) of Satish Dhawan Space Centre SHAR, Sriharikota and successfully launched India’s Hyper spectral Imaging Satellite (HysIS) and 30 international co-passenger satellites. GSLV MkIII-D2, the second developmental flight of GSLV MkIII successfully launched GSAT-29, a high throughput communication satellite from the Second Launch Pad (SLP) at Satish Dhawan Space Centre, Sriharikota. GSAT-29 satellite with a lift-off mass of 3423 kg, is a multi-beam, multi-band communication satellite of India, configured around the ISRO’s enhanced I-3K bus. This is the heaviest satellite launched from India. PSLV-C42 Successfully Launched two foreign satellites from Satish Dhawan Space Centre (SDSC), SHAR, Sriharikota. This mission was designed to launch two earth observation satellites, NovaSAR and S1-4 (together weighing nearly 889 kg) of M/s Surrey Satellite Technologies Limited (SSTL), United Kingdom under commercial arrangement with Antrix Corporation Limited, Department of Space. Both satellites were injected into 583 km Sun Synchronous Orbit.